Addressing structural barriers and creating cultural change is needed at the organisational level for women to succeed and advance in the legal industry. Transforming Women’s Leadership in the Law (“TWLL”), an initiative developed under Thomson Reuters' Legal Executive Institute, highlights organisations’ successes in removing barriers to the advancement of women and brings together powerful women in law, business, government and academia to share their experience of their rise to the top. Building on the success of the TWLL series in the US, TWLL hosted its first in Asia Roundtable Breakfast on 31 August 2016 in Hong Kong. 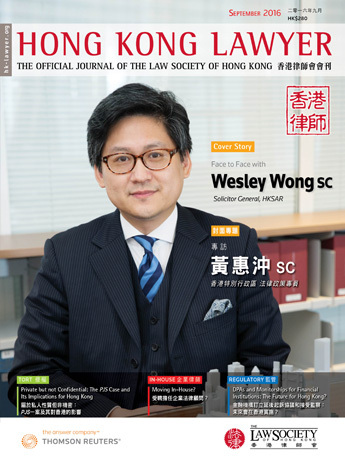 One interesting take-away from the lively discussion was that in spite of working in vastly different geographic settings many concerns raised by attendees in Hong Kong, which included three senior corporate counsel and three partners from large law firms, were similar to those raised by attendees in the US. The value-added by including female leaders in the East in this important on-going discussion was undoubtedly the insights gained on how gender issues play out across different societies, as most attendees’ personal and professional lives straddle Eastern and Western cultures. Two key themes that emerged during the Roundtable were professional development initiatives and work-life integration policies. It was widely agreed that more could be done on both fronts and would decidedly lead to better female retention rates. With Hong Kong’s shrinking workforce, retaining female talent is a key concern of leaders across all industries. Discussion centering on professional development initiatives ranged from acknowledging the importance of mentors and sponsors to women’s professional success to analysing a variety of women’s initiatives on offer at law firms and in corporations. One suggestion was to require leaders to sponsor women at every single organisational level; and at the highest level, to ensure women have access to mentors or sponsors outside their direct reporting lines. Also noteworthy was the group’s consensus that support for promising female employees should come at a much earlier stage in their careers. A few suggested that more structured support be provided around the 5–6 year PQE mark. On the corporate legal department side, there was interest in exploring the feasibility of seconding in-house lawyers from one corporation to another corporation to ensure employees remained engaged and challenged. Although it was noted that confidentiality issues may hinder such arrangements. Discussion surrounding work-life integration offered a glimpse into the mindset of lawyers from different generations. Many veteran practitioners often joke that the younger generation has it easy – in terms of current policies in place that allow for flexible working schedules; however, most agreed that more could and should be done to promote better work-life balance. The conversation also teased out some of the challenges that law firms and corporations face when trying to develop agile working policies due to the billable hour regime and the desire to foster collegiality between team members by working together in an office setting. Promoting policies that accommodate different cycles in women’s life was also discussed in depth. It was noted that in addition to maternity leave, firms and corporations can offer mothers the opportunity to transition back into full-time work through staged returns. Another suggestion was to better educate young lawyers – both men and women – about the variety of roles within the legal industry that provide different levels of work-life balance. It was widely agreed that this could lead to greater job satisfaction, as well as a longer lasting and a more fulfilling career in law. In terms of removing structural barriers, many felt that increasing awareness among executive-level professionals, including both women and men, and enlisting them to drive women’s initiatives was likely the best way to effect meaningful change. A few noted that many corporate policies that create barriers to women’s advancement in Hong Kong were generally put in place by previous generations and never questioned by current management, who often seem unaware of alternative options. Enlisting the support of senior leaders to drive diversity initiatives. Supporting internal and external mentorship and sponsorship schemes. Encouraging corporate executives to push law firms they retain to meet minimum diversity requirements. Being more understanding and empathetic towards female employees and supportive of female initiatives. Increasing transparency around paths to partnership and career advancements. TWLL plans to build on this productive first roundtable discussion in Asia by hosting similar events across the APAC region. All participants were excited to be a part of the conversation and eager to keep the discussion going. Please watch this space for more updates and reports on how female leaders view key diversity issues and collaborate to address them.